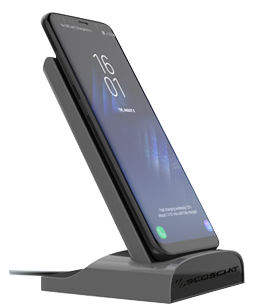 SCOSCHE® Industries (pronounced skōsh/skohsh), innovators of award-winning consumer technology, powersports and car audio products and accessories, continues to lead the industry in wireless charging solutions, both home/office and vehicles, by expanding its MagicMount™ CHARGE product line at CES 2018. The new MagicMount™ Pro CHARGE line combines award-winning neodymium magnetic mounting and a 360-degree adjustable cradleless design for advanced wireless charging technology. Each new mount gives users the ability to position and charge Qi-enabled devices without connecting them to the charger via a USB or sync cable. The entire line of MagicMount™ Pro CHARGE products wirelessly charge at 5W or up to 10W Adaptive Fast Charging, for the quickest charge possible on a variety of Qi-enabled smartphones, including Apple®, Samsung®, Google®, Microsoft® and more. The mounts’ technology is Qi Certified by the WPC (Wireless Power Consortium) to support wireless charging on all Qi enabled devices, including cases, receivers, and battery covers. Additionally, SCOSCHE’s new line comes with advanced safety features like foreign object detection, ensuring the upmost protection. Users seeking wireless charging solutions while on the road can count on the new MagicMount™ Pro CHARGE series for a variety of mounting options to fit any vehicle. Each unit includes USB car adapter, micro-USB cable and two MagicPLATE™’s with 3M adhesive. MagicMount™ Pro CHARGE Window/Dash – Secure any device to a vehicle’s window or dash with the StickGRIP™ suction base. MagicMount™ Pro CHARGE CD – Utilize a vehicle’s CD slot for a centrally located mounting option. Its portable design allows for easy transfer between vehicles. MagicMount™ Pro CHARGE Surface – Keep devices firmly in place on a vehicle’s console using the included StickGRIP™ mat, leaving windshields and dashboards clear of clutter. SCOSCHE® is also providing a new portable and versatile wireless charging option with the Qi DOCK POWERBANK™. This charging dock and powerbank can simultaneously charge a Qi enabled device and the powerbank itself wirelessly with 5W of charging output or up to 10W fast charging on compatible Samsung devices. One can charge and view their mobile device in either portrait or landscape orientation. The secondary USB port can be used for plug-in charging. In a hurry and on-the-go? The powerbank can still be used to charge a mobile device. The new MagicMount™ Pro CHARGE Qi Wireless Charging devices, as well as the QiDOCK POWERBANK™, will be available Spring 2018 at SCOSCHE.com and at leading consumer tech and wireless products retailers nationwide. Follow @SCOSCHE on Twitter, Facebook, GOOGLE+, Instagram, Pinterest and LinkedIn for the latest news on all of the company’s award-winning consumer tech and car audio products and accessories. And check out the SCOSCHE® Blog for informative articles on emerging technologies. About SCOSCHE (pronounced skōsh/skohsh): Founded in 1980, SCOSCHE Industries is an award-winning innovator of consumer technology, powersports and car audio products - committed to delivering superior quality, exceptional value and unmatched customer service. The designers and engineers at SCOSCHE develop products that reflect a rich heritage in audio and mobile technologies. SCOSCHE finds inspiration in the California lifestyle, culture, music and people. These influences can be seen in the accessories and products that are now in the hands, homes, offices and vehicles of people in over 50 countries. With hundreds of patents/trademarks and countless industry awards received, it is easy to see why SCOSCHE is consistently at the forefront of technology and innovation.